Academia Sinica, the preeminent research institution in Taiwan, is pleased to announce that its Taiwan International Graduate Program is now accepting application for the 2014-2015 academic years. Founded in 1928, Academia Sinica is now an internationally known research institution with more than one thousand researchers from Taiwan and abroad, most of them respected scholarships in their fields, working in thirty one institutes and research centers. In 2002, Academia Sinica established the “Taiwan International Graduate Program” (TIGP), a Ph.D. granting program in cooperation with the most prestigious national universities in Taiwan. Currently, it offers eleven Ph.D. programs and those who successfully complete the academic requirements will be conferred a Ph.D. degree by the partner university and a certificate jointly signed by the President of Academia Sinica and the Director of TIGP. There is a possibility for scholarships for successful TIGP candidates. 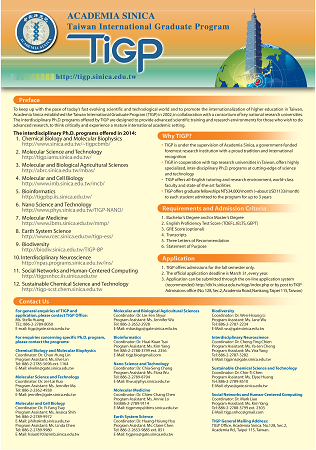 For application and further details, please contact TIGP, Academia Sinica.